The Valencia Bridesmaid Dress has a stunning, patterned beaded bodice and a flowing georgette skirt to die for. Look and feel your best at your next special event. 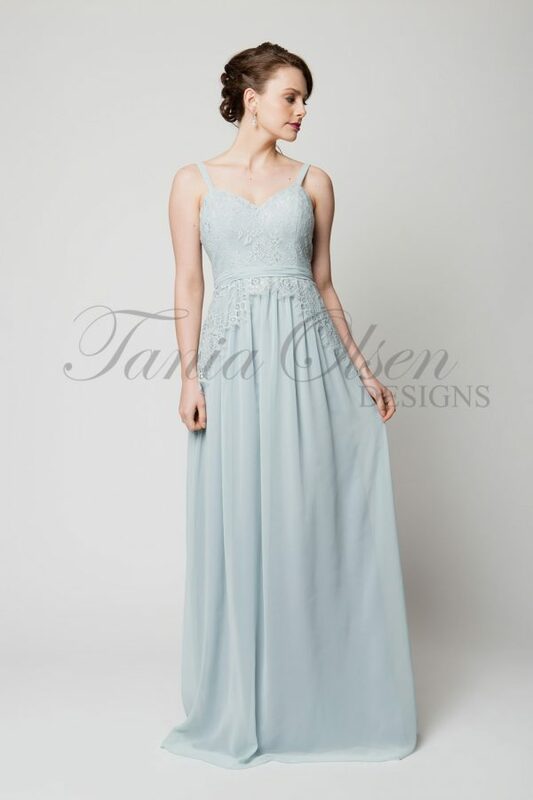 The Tania Olsen Designs Valencia Bridesmaid Dress is a sweet design perfect for many different special occasions. The gown has a stunning bodice and features patterned beading, a v neck, spaghetti straps and a double layer look ending at the waist. There is also a floor-length georgette skirt which is both comfortable and beautiful. NOTE: This is a PRE-ORDER item. PLEASE BE ADVISED THAT THIS STYLE IS SET TO ARRIVE END OF JULY 2019. PLEASE CONTACT CUSTOMER SERVICE FOR ANY FURTHER QUERIES. This black tie gown by award-winning Australian designer Tania Olsen, is flattering for a range of shapes and sizes. Contact us to find out more about this beautiful dress.